The legend of the orange Beast is one that strikes either fear, fanaticism, or bewilderment into the heart of all who come face to face with it. Even if you have no knowledge of the phenomenal power it wields, both its towering height and aggressive poise make it an intimidating creature to behold. Sometimes likened to a giant mutant supermoto, the 1290 Super Duke R left a metaphoric storm of motorcycling turbulence in its wake when it was launched in 2005. Like the now synonymous KTM orange livery and marketing battle cry of ‘Ready to race’, the shock tactics of producing such an outrageous machine were totally deliberate, in keeping with how KTM like to do their business. Long may it continue. At the heart of the Beast is a relatively free-spinning but low-revving, high-compression 1301cc 75° V-Twin. This is a wickedly potent mechanical equation which adds up to a terrific, monolithic lump of grunt, living in low-lying areas of the rev range where its competitors struggle to breathe. Yes it’s all over by 10,000rpm, but when you’re producing 10-20 per cent more torque than the next best supernaked right to the rev limiter, there’s no real need to flex your muscle any longer. 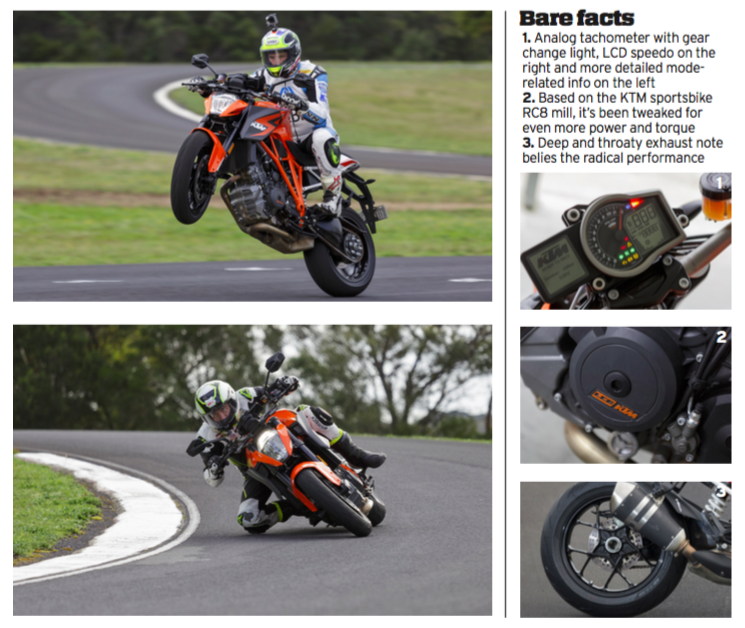 Despite its tall appearance and having the longest rider’s gait, the KTM isn’t any more challenging for the short legged than the Triumph or Yamaha. Soft and progressive spring rates in the Super Duke’s WP suspension mean that the bike actually settles lower once you’re mounted. For an old racing snake like me this also means the support at both ends is less firm than desired at times of high excitement, but on the whole the KTM is well suited to real roads and has enough compliance to get along with reasonably amicably on a long rough day in the saddle. Rider aids have reached a point where there really aren’t any bad systems – be it TC, ABS, AWC or any other acronym you could name – and KTM has been at the forefront of the electronics revolution from the outset. 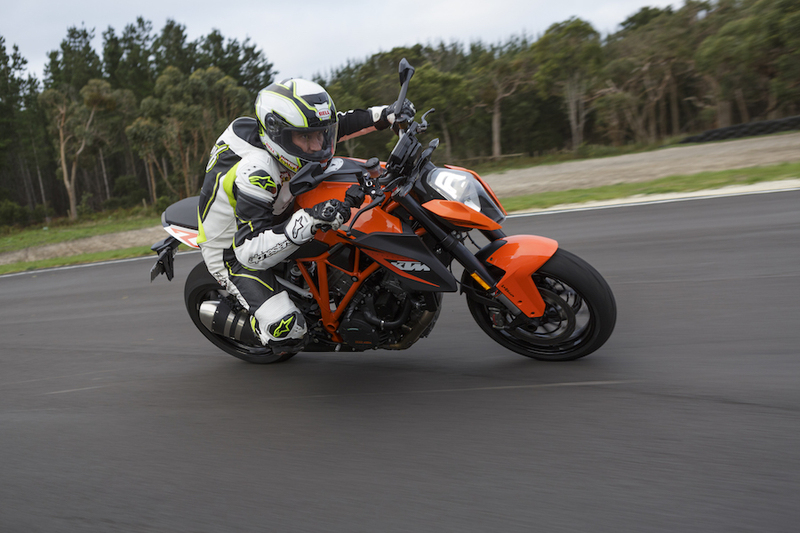 The Super Duke R truly needs these systems to make it accessible to mortals, so it’s entirely appropriate that it has the best in terms of operation, though this excellence doesn’t quite extend to an intuitive ease of adjustment. With a new 2017 model imminent, I can’t wait to sample what promises to be a new benchmark electronics package for the class. Perhaps the biggest challenge for the Super Duke among this competition is its price, which is topped only by the Ducati. But in the debate of justification for premium status, KTM need only point to the bitumen grinding potential of its machine’s mighty mill and yell, ‘match that.’ If you want the bike with the biggest gonads, you’d better like the colour orange. I wonder just where KTM can go from here with its 2017 Super Duke? All I know is, I’m bloody glad it’s me going to the world launch and not you. Craig Coxhell- Reminds me a bit of an adventure bike, you feel like you could take it anywhere. Plenty of torque. enjoyable to ride. A good all round motorcycle and a lot of fun, but under hard acceleration there was a lot of vibration through the pegs and handlebars, but in normal road riding this wasn’t as noticeable. Steve Martin- I’m not sure if it was the colour, size, or the style that caused me to take a while to warm to the KTM. But, as soon as I got on board I found out what this bike is all about. On tight bumpy sections the Super Duke rules supreme. Its aesthetics are probably great for a lot of people, but it still looks like a big motocrosser and feels like one once on board. Paul McCann – I was actually quite nervous about this bike considering the stories I’d heard before riding it, but the reality was quite the opposite. It quickly became my favourite on test and I think the stand out electronics package must have gone a big way to smoothing out that thumping 1301cc V-twin power delivery.